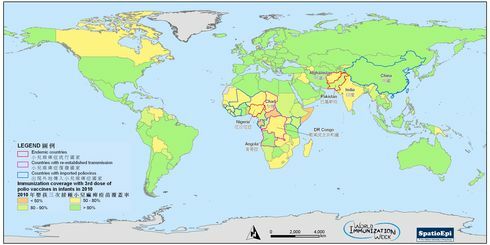 Despite global efforts on immunization, wild poliovirus (WPV) cases can still be found in Africa and Asia. WPV cases re-emerged in Somalia and Syria in 2013, where civil unrest was common in recent years and delivery of polio vaccines was impeded. 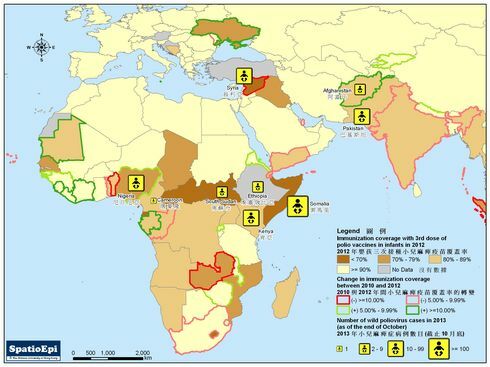 As of the end of October, 180 WPV cases (yellow baby symbol in the Map) have been reported in Somalia, accounting for more than half of worldwide cases in 2013. Poliovirus has also spread to 3 neighbouring countries, including Ethiopia, South Sudan and Kenya. Significant reduction in immunization coverage in Syria is represented by red country boundary lines. Coverage of the 3rd dose of polio vaccines in infants used to be more than 90% in Syria before 2011. As depicted by graduated colours, polio immunization coverage in 2012 in Somalia, Syrian Arab Republic and some countries in Central Africa is below 70%. While most of the WPV cases in 2013 in Syria were below 2 years of age, it is believed that this polio outbreak was associated with reduced immunization coverage in the past 2 years. Elsewhere in Afghanistan, Nigeria and Pakistan, polio remains an endemic disease. Evidently, low vaccination coverage in polio non-endemic countries could lead to significant public health impacts. The war against polio is not over yet.